To survive in the face of smart, connected and digitally adept customers, established firms need to understand what’s happening, and reinvent themselves to stay alive. When a pre-revenue company with about a dozen employees gets a $1B Silicon Valley payday, tongues wag.Did Facebook pay too much for Instagram– the popular photo-sharing app that lets users take and customize pictures with their phones – or not enough? The bigger question is why a larger, established company like Kodak didn’t invent Instagram, or an app like it. They have the resources, the talent and the opportunity. What is it that stalled – possibly fatally – this once-smart company? The short version is that they struggled unsuccessfully to adapt in the face of a changing digital world, filing bankruptcy even as photo-industry upstart Instagram was growing at the rate of about 1 million users a month. But the real story is much bigger. Kodak, like hundreds or even thousands of otherwise successful companies, has yet to grasp this critical point: digital innovation is enabling customers to act smarter than the firms that wish to serve them. Unfortunately, we’re guessing that about a third of Fortune 500 executives are running the next Kodak. They just don’t know it yet. Your customers changing expectations have forever shifted the ways they expect to be treated. In many cases, they also want these products and services customized, with the service they get taking their preferences and desired experiences into account – and get frustrated and impatient when companies can't meet these expectations. Unfortunately, most established firms aren’t prepared for this. Many keep data in silos, and don’t use it to benefit their customers. Different parts of the company treat customers in different ways (like sales and marketing vs. customer support). They haven’t leveraged technology or shifted business processes or products in a manner that permits intelligent use of customer insights. 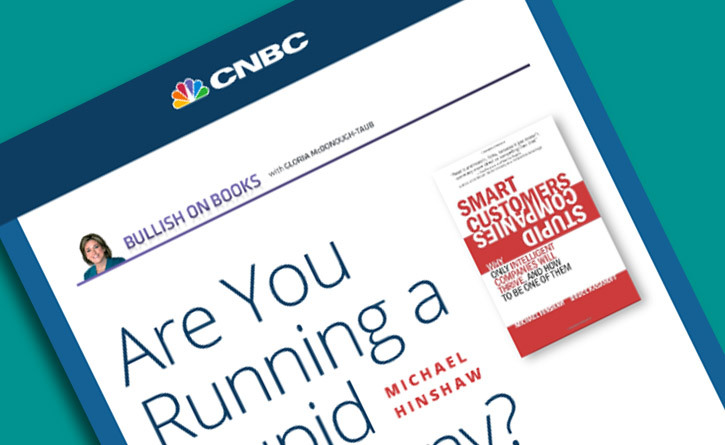 To survive in the face of these smart, connected and digitally adept customers, established firms need to understand what’s happening, and reinvent themselves to stay alive. You already know that digital technology is getting smaller, cheaper, more powerful and more prevalent. You also know that almost everything and everyone can now be connected wirelessly. But you probably don’t realize the degree to which these four disruptive forces work together to make it easier for customers to act smarter. With thousands of entrepreneurs and bright developers leveraging these forces to provide your ever smarter customers with ever better, ever more disruptive tools, it’s a certainty that game-changing innovation will come to your industry – if it hasn’t already. The speed of this change – the neck-snapping velocity that drove Instagram from zero to 30 million customers in under 2 years – is happening faster than management teams have reacted. This is somewhat understandable. After all, larger organizations are slower to change. Without the inertia of larger, established companies, smaller companies tend to be nimbler and more innovative. Yet when a bigger company “gets it” – such as Amazon , Apple , USAA, Zappos, and others – they dominate. Their markets are forever changed. The answer? Simple: be the first to disrupt your industry. It’s going to happen anyway and it’s much more profitable (and way more fun) to be the disruptor. Just ask Instagram co-founders Kevin Systrom and Mike Krieger. If you'd like to speak with someone at McorpCX, please reach out. Or learn more about the book.